Welcome to the August Healthy Dinner blog! We’re taking a break from our quest for healthy family friendly dinners to focus on another meal: lunch! 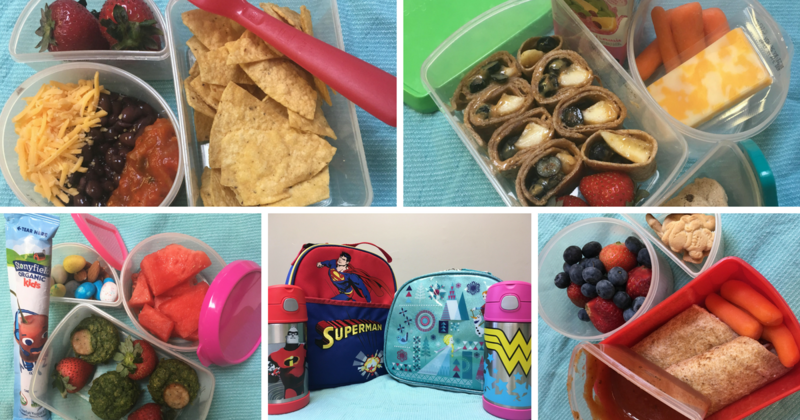 I’ve laid out some strategies for healthy, easy, and fun lunches that your kids will actually eat (especially those big kids heading off to school)! My kids don’t love sandwiches, so we’re thinking outside the bread. We’re also working on independence by packing lunches together. These lunches work for any age kid (or adult), though. 1) Quick and easy. I don’t care how fun a bento box that looks like a seascape is, that is time I do not have. If that’s your bliss, go for it! I’m looking for a lunch that takes 10 minutes or less. 2) Balanced. Protein, plants, whole grains. In a perfect world we’re eating some veggies, but fruits (especially berries) are a healthy choice, too. 3) Consumed. I don’t want these kids getting hungry an hour later. It has to be something they want to eat. Also, lunch box leftovers are yucky. 4) Served cold. It’s much easier to stick some ice packs in the lunch box than to worry about them refusing to eat room temperature macaroni (or the food safety issues that go with it). I got the kids in on the process and we brainstormed ideas. We spent the last few weeks test driving our ideas and judging them based on the above criteria. Here are our top picks! With a name like pizza dippers, you know most kids are going to eat it up. Kids’ favorite food plus something you get to dip? Homerun!!! This would be a great lunch for the parents, too. You could fill the dippers with veggies and add a salad for a healthy and grownup lunch. Spread 2 Tbsp. cream cheese on one half of the tortilla. Fill the plate/box: We served this with two carrots, fruit, and a few animal crackers. It was a HUGE hit with both kids! Peanut butter and jelly sandwiches are a lunch box staple and one of my personal favorites. Sometimes it’s nice to mix things up, though. This fruit sushi can be made with any type of nut butter (or even cream cheese), so you can make it allergy safe if your child or their friends have food allergies. Credit to my husband for calling it “fruishi” instead of fruit sushi, the kids thought it was hilarious! Roll up the tortilla and slice into rounds, pack it on its side so it looks like sushi! Fill the plate/box: This one came with carrot sticks, a few slices of cheese, and a couple mini chocolate chip cookies. Who doesn’t love breakfast? And eating breakfast foods at a different meal always seems special. One of my kids’ favorite traditions is ‘breakfast for dinner’ when Daddy is traveling. Pancakes usually require a knife and fork and I want something that won’t slow down the lunchtime process. We turned the pancakes into mini muffins and added a slice of maple chicken sausage. I used a green pancake recipe to boost the veggie consumption, but you can use whatever recipe your family loves. Bonus, you can turn this into a Sunday afternoon cooking activity for the kids, and have lunch for the week! Fill the plate/box: This lunch came with strawberries, watermelon, a yogurt tube, and some almonds and chocolates. We probably didn’t need the yogurt but we’re figuring it out. My daughter LOVES tortilla chips. She comes by it honestly -- I’ve definitely planned meals based on my desire for tortilla chips. This lunch gives her the joy of tortilla chips, but plenty of protein and some veggies to keep her fueled up for the afternoon. This is definitely a grownup lunch, too! I added extra salsa and a green smoothie to turn it into a lunch for me. Add black beans to a 1 cup container and top with the remaining ingredients. Fill the plate/box: I served this with three carrot sticks, strawberries, and a chocolate chip granola bar. The kids loved that they could mix it up themselves and fought over who got to eat more of this one. Those were our favorite lunches! Ben and Tess had so much fun testing all these recipes and practicing lunch packing. We hope you and your kids enjoy exploring them as well. I’m sure we will have plenty of lunches composed of apple slices and string cheese and that is just fine. The best lunch is the one that you want to pack and your kids want to eat. Join us next month for a fall favorite -- chili!